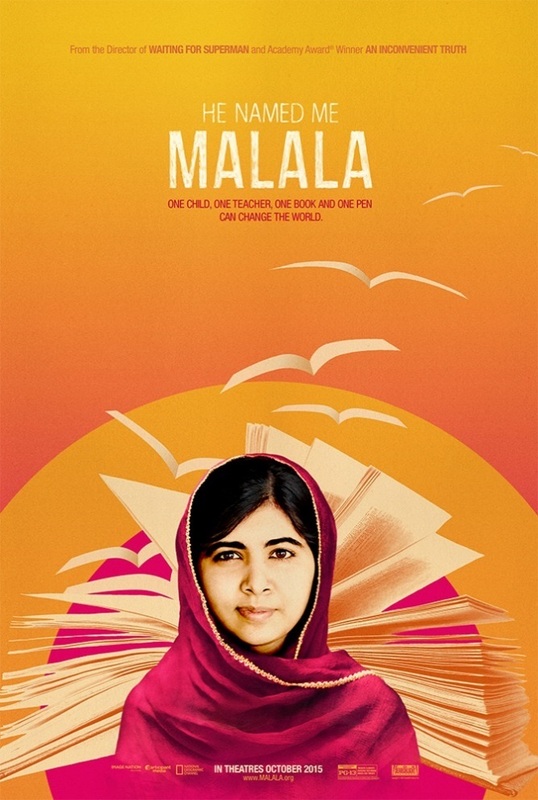 He Named Me Malala is a documentary directed by Davis Guggenheim, an American filmmaker whose films, An Inconvenient Truth, It Might Get Loud and Waiting for ‘Superman’, have been in the top 100 highest-grossing documentaries since 2009. Guggenheim’s film tells the story of Malala Yousafazai, a young Pakistani girl who advocates for girls’ education and human rights. In 2009, Malala, while living under the Taliban regime, began to write a secret diary for Aamer Ahmed Khan of the BBC Urdu website, about life in the Swat Valley. When the Taliban denied girls an education and started to destroy schools, Malala decided to speak against it, and for months she managed to defy the Swat Valley’s administration. However, on October 9 2012 the unimaginable happened, Malala was targeted by a Taliban fighter and shot in the head. Left in a critical condition, she was transported to a military hospital and later taken to the United Kingdom to receive further treatment. Against all odds she pulled through. With support from doctors and her family, Malala got back on her feet to carry on with daily life: going to school, participating in public speeches, and highlighting the struggle against the mistreatment of girls in Pakistan. She fought for children and young people in deprived countries, and has also fought for the right of education for every child. Reminiscences of Malala’s childhood appear extensively in the film with some narration by the girl herself, and it was beautifully made into an animation by Jason Carpenter. The film’s narrative felt slightly tedious at times, but listening to Malala being interviewed by journalists made me forget about its brief monotony. Her positive attitude towards the world, smiling face and loud giggles brought to light a picture of a modest and selfless teenage girl who is, without a doubt, an inspirational individual. Extensive interviews with her father, Ziauddin Yousafazai did slightly overshadow Malala’s story. It did not have a negative effect on the film though – on the contrary, his past involvement against the Taliban regime was as imposing as his daughter’s. He was the one who suggested Malala starts the diary, that’s why the audience might assume that he propelled her towards activism. Did he, or did he not? There was no clear answer to this question, apart from Malala’s short statement: “He only gave me the name, but the rest is my own doing.” How much truth is in what she said, I really do not know, but I don’t think it matters at this point. Malala still does more to help underprivileged children than any of us will ever do. The viewers were also taken on a journey to different parts of the world, such as Nigeria and Kenya. Unfortunately, it got to the point where I slowly started noticing that there was not enough information on Malala’s charity work, and projects to empower women in these countries. It seems like Davis left this bit out, leaving us with the desire to search for more facts concerning this subject. The film had its premiere at the Telluride Film Festival in Colorado in September, and it will be officially released in the U.S in October. The National Geographic Channel will also air the film in over 170 countries. Despite of a few imperfections in the documentary, I still think it is worth seeing it. It would be wise to read Malala’s memoir first, though, which inspired Davis to make the film. The book might give you a better understanding of the girl’s character, as well as her own vision on fighting against injustice and struggle for a better life for children around the world.